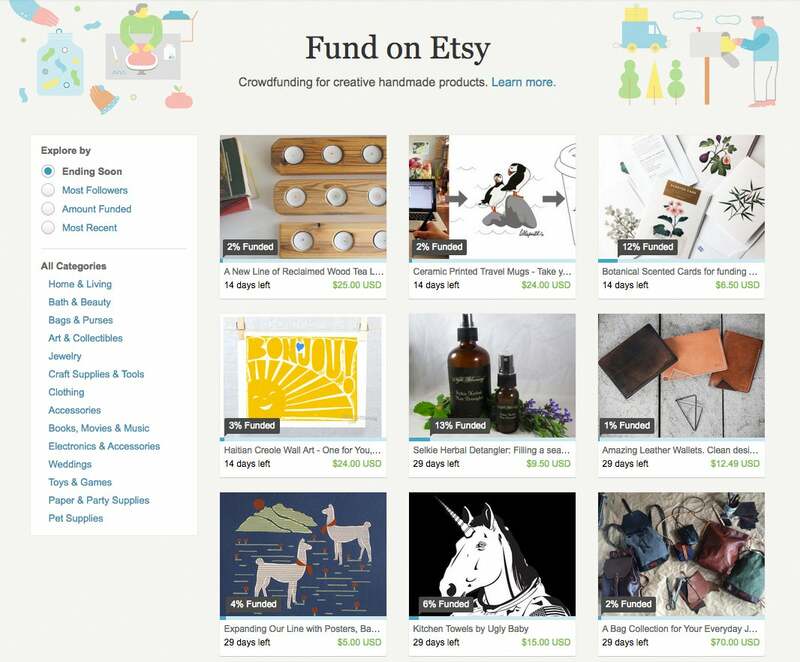 As Etsy approaches its 10-year anniversary this week, the crafty online marketplace is attempting to expand its product offering to include another hot service that is fertilizing the maker-movement: Crowdfunding. Today, Etsy took a play from another Brooklyn-based tech maker-movement company, Kickstarter, and is creating a crowdfunding pilot program. Etsy merchants can launch and run crowdfunding campaigns on the Etsy platform to pay for production costs including new equipment, material or extra help. Successful Etsy merchants have an existing network of client contacts who make prime candidates for crowdfunding donors. “We believe that crowdfunding on Etsy is a natural way for sellers to forge even more resonant connections with their existing communities and customer bases and to grow in ways that may not have been possible before,” Joe Lallouz, product lead for Etsy’s Maker Innovation team, said in a blog post announcing the new service. The crowdfunding pilot program will run for two months, from June 16 through August 16, only in the U.S., with a group of sellers who have been working to build their campaigns for the launch. The Etsy commission on the crowdfunding is the same as it is for the rest of Etsy: 3.5 percent of each transaction. Like the Kickstarter model of crowdfunding, money raised on the Etsy platform will only be distributed if the campaign reaches its full funding goal. Otherwise, the campaign owner does not get anything and donor credit cards are not charged. Pilot crowdfunding campaigns on Etsy include, among others, Wind & Willow Home’s effort to raise $4,500 to pay for production costs associated with a new line of wooden marbled dishes, KattysHandcrafts goal to raise $350 to expand her product line to include clay cups, and TM1985’s campaign to raise $10,000 to design and build a new line of smaller, everyday leather bags. For Etsy to add crowdfunding to its repertoire is an organic extension of its suite of maker services, but it’s also pretty important timing for the company to be polishing its image. The crafty marketplace has been struggling since its IPO earlier in April. Seperately, Amazon is rumored to be launching its own crafty marketplace, Handmade, which will go head-to-head with Etsy.